In a previous column the marginal disutility of labour has been discussed. The present column studies the positive side, namely the pleasure of labour and the quality of labour. An effort is made to construct a historic path, by means of a three noteworthy books. They are Arbeidsvreugde by H. de Man, Das Bewußtsein der Arbeiter by F. Deppe, and Van waarde by M. Sie Dhian Ho1. These books all combine empirical studies and a sociological analysis. Together they show how the disutility of labour (German: Arbeitsleid) relates to the modern neoclassical paradigm. Before analyzing the ideas of the three sociologists, first some marginal notes will be made with respect to the column, just mentioned. There the utility of labour N(t) is presented as a function of time. Among others Alfred Marshall assumed, that in principle labour has a positive utility, because it can be a pleasant and mentally rewarding activity2. The reader will undoubtedly agree with the columnist that this assumption is hardly realistic. Payed labour is always a burden, because it is subjected to the coercion of repetition and productivity3. The utility of labour N(t) is negative. Therefore a better expression is disutility, displeasure, or pain. The disutility of labour L(t) (= -N(t)) is sometimes displayed graphically as a curve, for instance by Sam de Wolff. This is only meaningful, as long as the intensity of labour remains constant. There is supervision. For when the worker could diminish the pace of work or the effort of labour at will, then the curve would become fluid and she loses any pretence of a general validity. Another point of attention is the importance of the working-time ta, because during the day the disutility of labour increases. The marginal disutility ∂L/∂t is positive. It is evident, that the personal preferences of the worker will change, as soon as hij returns home in an exhausted state. Then a time of recovery is indispensable. In such a situation the usual utility analysis of the neoclassical paradigm can not simply be applied. The worker can escape from the disutility of labour during the leisure time, defined as tv = T − ta. The boundary on ta is the maximal physical burden T, where the night's rest equals 24 − T (in hours). In the modern neoclassical paradigm the leisure time has its own utility (for instance watching TV programs, or maintaining an allotment garden), and thus its own price. This model changes somewhat, when a negative utility is attributed to labour. For there is a subtle difference between the disutility of labour and the utility of leisure time, namely that the first one can be reduced by an increased quality of labour. According as the society develops, the disutility of labour will diminish, whereas the utility of leisure time will probably rise. The development of the supply on the labour market contains naturally information about the preferences of the workers. Unfortunately the shape of the supply curve is the subject of speculation. The figure 1 shows two possibilities. The horizontal axis shows the daily working-time ta. The vertical axis measures the wage level w. The red curve is the shape, according to the usual expectation for a supply of goods, and which has been derived in the column, just mentioned. However, the factor labour is not just a common product. In practice the supply turns out to exhibit different behaviours, depending on the considered range of the wage level. The figure 4 shows four of these ranges, numbered as I, II, III and IV 4. 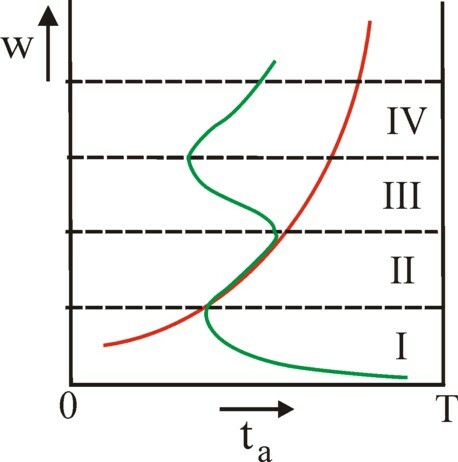 The green curve shows how these ranges correspond to various preferences of the workers. The range I characterizes the extremely low wages, which offer a marginal existence for the worker. The consumer goods have an existential utility for him. When the hourly wage falls further, he is forced to work longer, in order to stabilize his income. The range II matches the common behaviour of supply curves. Here the substitution effect is visible: a rising wage level makes in fact the choice for leisure time more expensive, which results in an increased willingness to work longer. The range III displays the so-called backward bending of the supply curve. This is explained by the income effect. Thanks to the rising wage level the worker disposes of more means. It is evident that he will expend a part for increasing his leisure time. His material needs have become almost saturated. Finally, the range IV corresponds to the level of welfare, where new opportunities for consumption become available. The typical example is the acquisition of a mortage in order to buy one's own home. This need, which was previously beyond realization, stimulates the worker to increase his working-time, despite the higher wage. The figure 1 shows clearly, that the supply of labour is a complex phenomenon. Suppose that due to the morale of the workers the peope would prefer to work under any condition. Then the supply would be a vertical line at the particular working-time ta, which is required by the morale. It is worth noting, that in the case of the green curve several equilibria are conceivable on the labour market. For the demand curve is falling with the wage level, and can thus intersect the supply on four places. And finally it must be remembered, that partial markets do not exist, and this also holds for the labour market. A change in the wage level will lead to other product prices. In this way a rising wage level can lead to a lower real wage. And in the theory of the marginal utility the workers will base their decisions, also with regard to their working-time, exclusively on the real wage. The falling supply curve in the range I is clearly caused by the disutility of labour. The worker actually believes, that the wage level does not fully compensate his efforts. But he has no choice, because the society offers no alternative (except for a direct starvation). On the other hand, in the range III of the backward bending curve the worker does have a free choice. The utility of leisure time is decisive. Yet it is also here obvious, that the quality of labour will influence the decision. This aspect of the displeasure of labour is ignored in the neoclassical model of the labour market. Those who want to study the disutility of labour, will naturally land in the books of social-democrat authors. This is not a coincidence, because the social-democracy had her definitive break-through in the nineteenth century, when the displeasure of labour caused bitter grief. Although Hendrik de Man, Frank Deppe and Monika Sie Dhian Ho all belong to the social-democrat movement, at first sight they have little in common. Yet this selection of your columnist is well-considered. At the beginning of the twentieth century the revisionism, with Eduard Bernstein as its icon, drew the attention to the diminishing disutility of labour (and to many related developments). This led to the abandonment of the revolutionary class struggle. Besides, the rise of the psychology as a science yielded many new insights. The Belgian De Man was one of the leading ideologists, who integrated the human psyche into the social-democrat paradigm. Although his sociological works were published already around 1928, they remain interesting to read. The book Arbeidvreugde has a special quality, since it is based on 78 in-depth interviews with politically engaged workers5. Although the German sociologist Deppe is a leading publicist since half a century, the selection of his works may come as a surprise. For he resides commonly in the circles of trade unions, where he assumes the attitude of a revolutionary socialist. This makes him a marginal person within the social-democracy. Moreover his studies focus on the situation of the industrial workers. Nevertheless, his work is relevant for the concept of the displeasure of labour, because he tries to interpret the roaring period of the late sixties as a revival of that displeasure. Besides, his book Das Bewußtsein der Arbeiter contains a summary of empirical studies on the workshops of that time. Thus it is a critical test for the predictions, that were made by De Man, forty years before. The political scientist Sie Dhian Ho is director of the scientific office of the Partij van de Arbeid. So she plays a central role within the modern social-democracy. Her ideas about the disutility of labour are topics of the day, and await the judgement of time. At the moment, forty years after the publication of Deppe, she propagates within and outside her party the so-called Van waarde debate, which tries to renew the social-democrat philosophy of life. This debate is definitely a milestone for the Dutch social-democracy, even though the result is uncertain. Her book Van Waarde builds on the study Vooruit6, where in-depth interviews display the daily lives of 54 people. Deppe draws the attention to the three-phase model7. The history of capitalism is a sequence of three forms of organisation of labour. She starts with the manual labour in the manufacture. In the nineteenth century, notably during the turbulent years 1845-1850, the large-scale industry appears, which more and more mechanizes labour. The third phase is the automation of labour. The automation soars high after the Second World War, even though decades before De Man already predicts her importance. The displeasure of labour reaches its peak during the second phase. The more or less independent craftsman loses the competition with the large-scale industry, which thanks to the division of labour can produces much more efficiently. Henceforth the former craftsman is reduced to the status of an employed industrial worker. Already in the first phase many share this fate in the manufacture, but due to the high degree of mecnanization the large-scale industry decouples the worker from the end product in a radical manner. In that situation the worker produces merely a single part of the assembled product, in the endless repetition of mass production. Moreover, skill is no longer a desirable qualification. The mechanized production requires merely unskilled labour. The wages are in the range I of the wage scale (see figure 1). In this period the leading authors about the social conditions are obviously Karl Marx and Friedich Engels. The third phase of automation relieves the workers from the burden of the repetitive labour. Henceforth the machine herself performs all those operations. The worker transforms from an attachment of the machine into a supervisor and controler. In other words, they become the ruler of the machines. This type of work makes high demands with regard to the qualifications of the factor labour. The workers must be able to operates the automaton, within complex social organisations. An ever larger part of the workers is employed in services and in office jobs. This all raises the quality of work, and thus the pleasure of labour. The wage level rises to the range II, and since the mid-fifties of the previous century even above this range. Sie Dhian Ho adds a fourth phase to the development of capitalism, albeit without a formal statement. In this phase the economy becomes truly global, so that the western states are confronted with the strong competition from the emerging states elsewhere. It is true that in the mean time the western wage level has reached the ranges III and IV, but the jobs are no longer a certainty. The workers must adopt a more flexible attitude. Due to the fierce global competition the western economies become post-industrial. And for the first time in a century the workers must face the possibility of a stagnant or even falling prosperity. According to Deppe a disadvantage of the three-phase model is that it limits the analysis to technological progress in the workshop. However, in practice all kinds of social factors outside the workshop contribute to the disutility of labour. The work of De Man summarizes those social effects on the conscience of the workers in a way, that is still usable. These effects operate more in the psychical sphere than in the physical, but nevertheless they are hardly less depressing. Several remarks of De Man illustrate the material disutility of labour, even around 1925. He writes: This is the reason, that many interlocutors deny that exhaustion is the cause of their repulsion against labour, even though the signs of a chronical physical stress are clearly visible on their face and in their posture. ... At least half of the [adult (EB)] pupils seem to be have been undernourished for years. ... [The reports] indicate clearly, that the nervous "central" or psychic fatigue does much more harm than the purely physical. Incidentally, it must be noted that at the time these German workers experienced worse conditions than their Anglosaxon colleagues. The table 1 summarizes in a succinct and incomplete manner the factors, which according to De Man contribute to the displeasure and pleasure of the worker. The table 1 shows that the disutility of labour originates from a complex of factors. In principle the aggregate could be found by attaching a weight to each factor, and subsequently sum them8. Following Marshall, among others, De Man assumes that people naturally strive for pleasure of labour. In his time the wage level is commonly a source of irritation, because it does not increase with the productivity of labour. The low wage level is considered to be injust, fraudulent and even exploitation. This proves that the workers have their own view about a just compensation. Apparently the interviewed workers are still in the range I of the figure 1. A higher wage is existential. Incidentally, there is still ambiguity with regard to the demand for leisure time, because few workers engage in hobbies. Then the utility of leisure time is simply small. The trade unions oppose mainly the excessive workload (that is to say, the intensity, so the marginal disutility). When Deppe writes his work, the wage level has already reached the range II. In the footsteps of the influential economist J.K. Galbraith the sociologists discuss the affluent society or the pluralist society. There is no longer a need for the revolution, since the redistribution of the abundance satisfies all9. In the era of De Man the labour class was still revolutionary. But in the third phase she abandons her claim on the social rule and integrates into the society. The ruling order is accepted. Another forty years later also Sie Dhian Ho must admit, that the believe in collective action has waned. In the mean time the wage level of the workers has reached the ranges III and IV of the figure 1. A job without a challenge is a source of displeasure. Reversely, the professional labour contributes to the satisfaction. Therefore, the disutility of labour peaks precisely during the early industrialization around 1850. But De Man states that contrary to the expectations of Marx, the loss of skills does not persevere. Apparently he imagines already the third phase, where the automation requires highly skilled workers. The equipment is merely a tool. Nevertheless, much labour remains repetitive, and mind-numbing. In extreme cases these wearing activities can end in a total exhaustion. Deppe shows that also in the third phase the skilled creativity is missing in some labour. The challenge is in the management and control of the production process. In those cases where the work remains monotonous and mind-numbind, it is nothing more than a source of income for the workers. This group of workers with a low qualification has no sense of loyalty towards its enterprise. Here it is common that a single family has several bread-winners. Now that the consumptive needs are satisfied, this group finds pleasure and utility in the leisure time. It is true that at work this group does not find opportunities for the personal development, but otherwise there is social mobility, for instance in housing (including ownership). The private sphere gains in importance. Deppe states that the (then) modern industrial workers demand mainly a good wage, a decent pace of work, and job security. The same statement is made by Sie Dhian Ho, for the worker in the year 2013. She thinks that the quality of labour requires team work and good relations in the workshop. Besides income she stresses the importance of the pleasure of labour, which consists of challenges, personal development, social contacts, and identification. A sufficient demand of labour is an important precondition. Sie Dhian Ho states that the pleasure of labour increases the productivity, and stimulates innovation10. But she in fact expects a less promising future for the workers, due th the economic globalization. She fears notably a rising pace of work, unqualified management, and insecurity due to continuous reorganizations. In the fourth phase the education and formation have a high priority, because the highly-qualified work increases the competitive strength. Thus for the moment the achieved paths of personal development are maintained, so that the opportunities for pleasure at work remain satisfactory. At the same time Sie Dhian Ho warns that a good education is no longer sufficient. Namely, when it can be combined with a meritocratic winner takes all mentality, then the formation can be used as an excuse (apology) for increasing inequalities of wealth. Sie Dhian Ho states with regret, that not all people are able to participate in the social mobility and the civic culture. Vulnerable people are difficult to activate11. The table shows clearly, that the environment both at work and outside the workshop is an important factor for the pleasure and for the experienced disutility of labour. The organization in the large-scale industry causes scepsis among the workers. A management based on a hierarchy stifles the pleasure of labour. De Man even states, that workers feel an aversion with respect to the hierarchy. Their anger is mainly directed towards their supervisor, a function created on military lines. Incidentally, De Man believes that here the German culture is to blame, since in the USA this aversion is less pronounced. The need for a hierarchy is not questioned, but she must be accompanied by co-management of the workers. De Mann stresses, that many workers have become so dull that they are incapable of initiative. In the phase of the automation the administrative and service sectors experience an impetuous growth. In the enterprise a layer of highly qualified technicians emerges, which has been called the technostructure by Galbraith. Thanks to her crucial position she disposes of significant power. In this manner she establishes the co-management, which De Man desired. The manners in the enterprises tend towards harmony, so that the industrial workers submit freely to the middle-management. Leadership now requires the skill to organize and coordinate. The automation favours a more horizontal organization structure. Henceforth the workers are a countervailing power, together with the consumers. Incidentally, Deppe also cites sociologists, who profess to observe a new industrial class struggle between workers with low and high qualifications. In the late sixties of the last century the dissatisfaction indeed resulted in a massive and militant rebellion. Due to this dynamics Deppe has an unabated faith in the revolutionary elan of the workers. Here Deppe does not deny the scepsis and apathy, which also in the third phase reign among the workers with low qualifications. It is true that the threat of starvation has gone, and the workers appropriate an increasing part of the wealth. But with the exception of the consumptive emancipation their existence is as distressful as in the times of De Man. They feel that their activity is empty and repressed. Also their social status remains the same. The participation at all levels places new demands on the structure of the society. The digestion and use of information surpasses the property of the means of production as the main instrument of power. Therefore Deppe observes a growing pressure on social groups to really participate. Just like De Man he welcomes more democracy and co-management in the economy. Apparently the rise of democracy is not an autonomous tendency, because in 2013 Sie Dhian Ho is still worried about the erosion of the co-management at work, and even the erosion of the consultation for social security such as health care. The individualisation has undermined the countervailing powers. The social regime of the sixties turns out to be volatile. Nevertheless, Sie Dhian Ho believes that bureaucracies are a threat to freedom and consultation, although they could be countervailing powers. They become so big, that even the highly qualified workers lose their influence on the management. Usually neither the workers nor the entrepreneurs are interested in the social utility of the production. Especially De Man stresses that the people may be eager to work, but they interpret this occupation as a social obligation, and thus as an externally enforced norm12. De Man points out, that the fulfilment of ones' duty must always be hailed as a source of pleasure, irrespective of the socio-economic system. In his view the people must accept work as an inevitable sacrifice and destiny. This can even create a sense of pride. Therefore Sie Dhian HO is positive about the social participation, which has already been descried by Deppe, and which has since, notably in the nineties, become the leading principle for the policy of employment and is presented as an obligation. In order to fully understand the concept of disutility of labour it is essential to view the workshop as a community by destiny, and not as a community by ideas. The trade unions are motivated by a professional egoism13 and by a shared interest. The solidarity is imposed by the external conditions, notably by the power struggle with the command hierarchy in order to secure respect. De Man makes the fascinating observation, that the origin of the concept of solidarity can actually be found in the political sphere. In the beginning she was truly surmounting the class barriers and cosmopolitan, but due to the suffering of the proletariat she narrowed into a class interest. Deppe confirms the ideas of De Man. In the sixties the sociologists discover that the class structure has disappeared, and with her also the class conscience. Therefore Galbraith suspected, that the traditional trade unions would lose their reason for existence. Incidentally, Deppe is not sure about that, because three quarters of the workers remain excluded from the technostructure. Besides there is still no equality of opportunities. The state can not secretly make compromises with the industry. The democratic forces incite him to support the economic coalition of workers and consumers (the countervailing power, already mentioned). The class struggle dissolves into a competition between a diversity of bureaucracies (in Dutch: the polder model)14. Sie Dhian Ho shares the view of De Man, that notably the politics (in the form of the social-democracy) has the mission to organize the solidarity between individuals. Such a project can only succeed, as long as it is carried by an ethically inspired ideal. That ideal must appeal to the values of people. This hypothesis of Sie Dhian Ho hands over the primacy to the citizens, who need to support the reforms and revolutions. But she also fears that the existing sociological ideal of the Rhineland consultation model will break down. Under the pressure of the globalization the state again takes sides with the industry. The desire to reduce the expenses undermines the willingness of the state to be a model employer. Sie Dhian Ho, in imitation of De Man, notices that the bond of destiny in a community reinforces the self-consciousness, and thus stimulates the emancipation. However, when closed communities emerge, then that is perhaps just as alarming as the advancing mentality of the market. Notably Sie Dhian Ho fears a widening gap between the people with a lower and higher education, which may well re-establish the class society. For instance they can be clearly distinguished in the health statistics. When the cohesion in the society weakens, then the solidarity and the quality of life will be affected. Here she introduces a new aspect, namely the option of mobility out of ones' community. This exit option prevents that individuals are locked up. Especially the onset of multiculturalism in the society implies, that the modern norms and values are no longer self-evident. Notably the closed communities of migrants have the tendency to subject members in their group to social repression. Moreover, the migrants as a whole suffer from their low social status within the Dutch society. Incidentally, in this form of displeasure the connection with labour is rather vague. Indeed migration is often related to labour, but sometimes also to the status of refugee (migration in order to escape from threats)15. De Man draws the attention to the regional differences in the organisation of labour. Due to the European class society the social mobility was minimal, which meant that the labour movement could dispose of a reservoir of extremely competent persons. They found their fate unbearable, and it incited them to engage in social action. The labour movement gave them the opportunity to unfold their talents. Thus the reader sees how disutility of labour exists, completely independent of the work load. In the USA there was always an significant vertical mobility, so that the labour movement remained fairly primitive. Still there was pent-up wrath. De Man believes that this apathic group can find a secure existence and hygiene in the large-scale industry. According to De Man they can find their pleasure outside of the workshop. He thinks that this is no problem, as long as this is a choice of free will. Deppe analyzes the peculiarities of the French labour movement. In that state the industrialization has started late, so that the situation of the industrial workers has always been awkward. Therefore they are more radical than their Anglosaxon colleagues. De Man observes already in 1928, that the workers tend to seek (in his words) the narrow-minded imitation culture. He even fears a mental levelling. Since the worker must try to unfold himself beyond the workshop, he leaves the traditional associations and becomes an individualist. It is a challenge to satisfy the increasing needs in the workshop itself. De Man suggests that the technological progress could be presented as a new source of meaning. For the worker is a producer himself, who is inclined to reduce his own costs. The costs take the shape of displeasure of labour. It is striking, that the workers are very keen on efficient and innovative methods of production. The workers realize, that an increasing productivity of work is useful. Thus the worker in the assembly line serves the world market. The work of Deppe gives a clear picture of the individualization. The technostructure perceives herself as a social middle group, and she has weakened collective morals. So Sie Dhian Ho must conclude, that the collective action is no longer common. She does believe that the technological progress is a social advancement. But due to the globalization the people become trapped in markets and bureaucracies. Sie Dhian Ho thinks that the abolishment of the global Bretton Woods system has transformed the global economy. The negative effects of this measure became apparent after 1970, so after the era that is described by Deppe. Now, almost a century after the publication of the work of De Man, according to Sie Dhian Ho there is still a faltering social mobility, because within the families the backwardness is transferred to the next generation. When De Man mentions the insecure existence as a cause for displeasure of labour, he refers notably to the fluctuations in income. This problem is especially evident in the piece-wage. The entrepreneurs can easily manipulate that wage system. For the workers can no longer determine the average wage, which is paid in their branch. It is difficult to determine the trend in the development of the wage level. Also the loss of the job contributes naturally to an insecure existence. The continuous threat of dismissal leads to the disengagement of labour. Deppe shows, that at least the industrial workers of the third phase still live in an insecure situation. The reason is mainly the continuous improvement of the productivity of labour, which finally leads to a shrinking employment in these branches. In the phase of automation the social security guarantees some feeling of stability. Yet Deppe finds that industrial workers with a low eduction have a pessimistic attitude and suffer notably from a lack of trust in the future. They live by the day, and hardly save any money. In this regard the empirical studies reveal national differences. The previous paragraph has already given several examples. In other words, the security of existence of the workers has become varied, both within the enterprise and between states. The empirical study of Sie Dhian Ho reveals again a decreasing job security. In the mean time the industry has lost her position as the leading employer16. There are two reasons: first, the labour productivity rises more than the material needs. And second, many industrial labour is transferred to emerging states such as China and India. Under the pressure of global competition the western enterprises and organisations prefer to externalize their costs. That is to say, the risks are shifted to the workers. There are again working poor. This development has not yet ended, and it will also affect the middle class (say, the workers with a high qualification). It is interesting that Sie Dhian Ho sees an increasing number of economic crises, often due to financial malpractices. In her eyes the structural stability of the global economy is undermined. This obviously has an immediate effect on job security. The fluctuations are absorbed partly by the rise of flexible labour. Sometimes this is a win-win situation, but not always. This column shows the complexity of the concept disutility of labour. It depends on so many factors, that an analytical model can hardly be expected. At the same time it is clear, that labour is definitely not a neutral phenomenon, which serves merely the satisfaction of material needs. For labour itself has an immediate and far-reaching effect on the well-being of people.